Cryptocurrencies have become a wave since the past few years, and many have successfully ridden it, making millions in the process. ‘Disruptors’ as they are known have started companies in the blockchain that offer financial services and monetary exchange in return for the hottest cryptocurrencies available today. An independent system that runs parallel to the mainstream financial world offers a promise of a bright future for those who will invest their trust in this otherwise unconventional electro-monetary market. However, without being backed by gold or any other standard with intrinsic value, the cryptocurrency market sometimes feels like a castle builds on a heap of sand. The cryptocurrency network is completely decentralized which renders it no regulating authority to formulate its rule or conduct some basic checks and balances to keep investor’s trust in the system. This is actually a positive side of the cryptocurrency network as it allows more and more people to participate and contribute to the market. And if at all you are still wondering about ‘where does it get its intrinsic value from?’ it is the technology behind those cryptocurrencies that renders them a monetary significance. This is where cryptocurrency mining comes into the picture. Or to say Bitcoin mining since both the terms have become synonymous with each other. Now here comes the core of the ‘intrinsic value’ factor of those cryptocurrencies. Most of the cryptocurrencies work on the double SHA 256 algorithm, where a crypto miner has to solve a mathematical encoding algorithm that is used for encrypting files in a network. Hash function in computer world means a program that converts an input to randomly generated characters. To put in laymen’s terms, cryptocurrency mining is a process of solving a complex mathematical problem using computing resources to create a block in the blockchain network. The person who joins the network with his computing resources is called a miner. For bitcoin or any cryptocurrency to operate we need a network of miners to help the transactions going and new coins will be generated in this process. 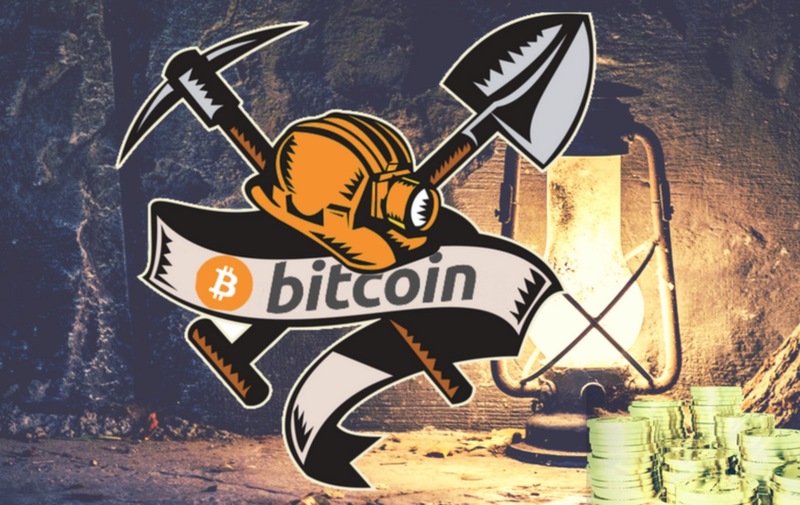 Since the miner is providing computing resources, for every successful block creation, he will be rewarded with new coins (For bitcoin it is ~12.5 bitcoins). More computational resources a miner has, the faster he will solve the mathematical problem. The process begins with mining a block. Here, the miners collect new transaction into a solving block. Then the miner hashes the block to get a 256-bit hash value. For bitcoin, the hash value should start with several zeros (According to the bitcoin protocol). If it gets solved, the hash value becomes the identifier of the block. When the hash is not successful, the block is modified and re-tried. So on what basis the miners will try to find the hash? it’s complete guessing. Yes! it is guessing. That’s the reason, miners use a lot of computers to guess this hash value that starts with several zeros. A rough estimate states that one block is created every 10 minutes. However, the number of Bitcoins (or any other cryptocurrency for that matter.) contained inside a block keeps changing from time to time. Once a block of cryptocoins is mined, it is sent to the Blockchain network. Other miners in the network will verify the hash value of the block and its transactions. This is called Proof Of Work (POW). Once verified, the block will be added to the blockchain network. So that says it all. It is solving a mathematical encryption riddle by trying combinations of hash functions for the block. 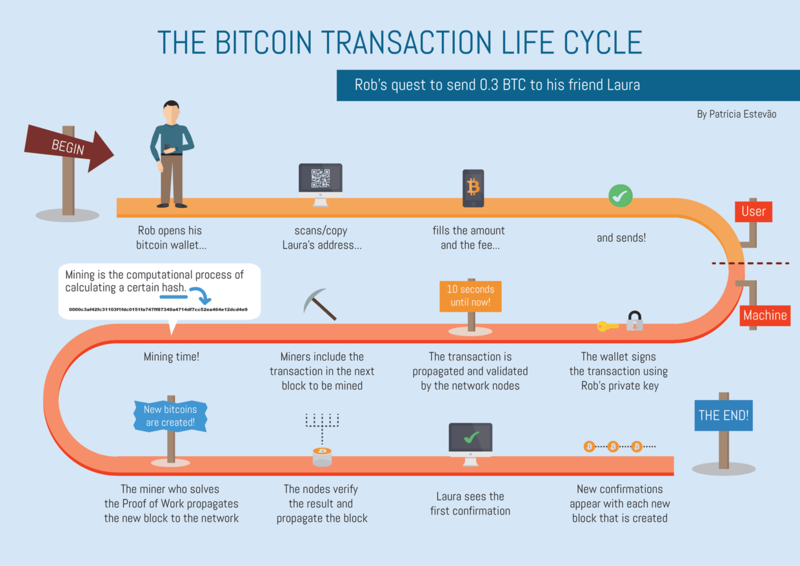 An example bitcoin transaction diagram created by Patricia is shown below. As obvious it must be, computers are the most basic tool that is required for cryptocurrency mining. You don’t need to have a complex and powerful computing machine for doing all the mining job, although one that is powerful will do better. There are companies that are dedicated towards mining Bitcoins or other crypto coins. An internet connection is another obvious requirement in the list. Or Graphic Processing Units are just powerful CPUs, the microprocessors that run computers. GPUs are used for gaming which makes them powerful and stands apart from CPUs. The specialized nature and power delivered by GPUs render them useful for Bitcoin mining as they have a high data processing power as compared to CPUs. If you have an ASIC, you don’t need to use a GPU. Application Specific Integrated Circuits are needed for processing complex data and making the difficult calculations pertaining to the hash functions. As the name explains it all, ASICs are specifically made for crypto mining operations. AntMiner is one such ASIC box that many quality Bitminers prefer. While ASIC is the hardware that you need, you are still going to need a software is required for mining crypto coins. The software provides you an interface to view the mining process and helps you stay in the loop of progress. Even though your ASIC is running hard and high, you are still going to need cooling devices, or else your whole system might come crashing due to the heat. The amount of heat generated by those processing devices while they solve these hash functions is tremendous. You won’t forget the heat if you ever hold your hand closer to one such computing device. Cooling gels applied on the fans can be an add-on advantage to sooth the heat generated by all the data processing. All that being said, crypto mining can also be done on the cloud. Also known as Cloud Mining, it is when you mine crypto coins without having to invest in all the hardware and software on your own machine and in your own room. You can also join the crypto mining pool which works like a carpool. You can pool down all your resources in a crypto mining endeavors alongside others who are willing to do the same and share the bounty. Besides, there are also applications online where you can do a cost-benefit analysis of all your crypto investments in hardware and software and measure them against the gains you have in your cryptocurrency earnings.